We will weave two samples on looms which have been set up with the warp threads at different spacing. The patterns will be produced by using two shuttles in various sequences to put the weft in place. 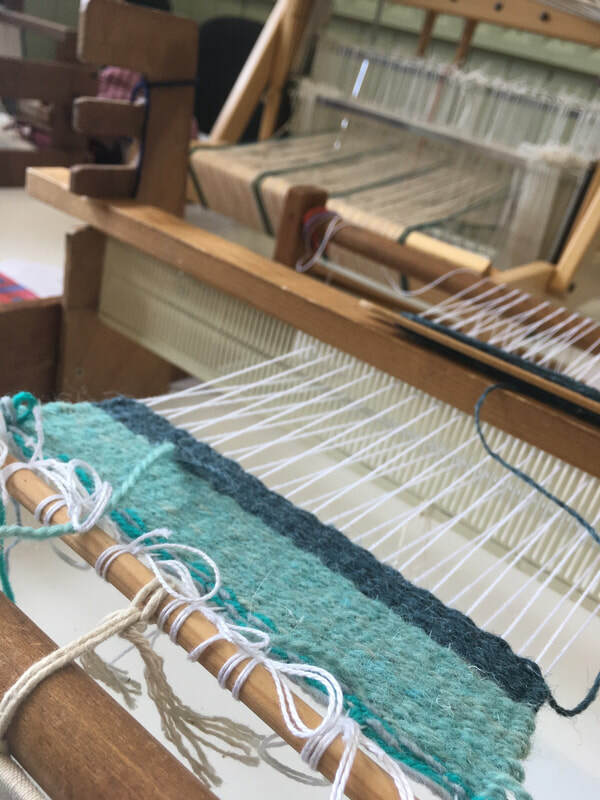 One sample will be woven on a loom which has been threaded at eight or twelve threads at inch with two colours of yarn in stripes of different widths. The same two yarns will be used for the weft. Both the warp and weft contribute to the design. The other sample will be woven on a loom which has been threaded with white cotton spaced at about 4 threads an inch. These threads, which are the warp, will be completely covered by the weft. You could also experiment with techniques for weaving scenes. All materials, tools and equipment will be provided by the tutor. The approximate cost of these will be £5.00, payable to the tutor during the course.